Navy Department, Auguet 7, 1845. 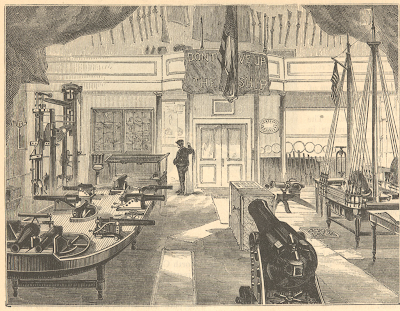 Sir - The Secretary of War, with the assent of the President, is prepared to transfer Fort Severn to the Navy Department, for the purpose of establishing there a school for midshipmen. In carrying this design into effect it is my desire to avoid all unnecessary expense, to create no places for easy service, no commands that are not strictly nec­essary, to incur no charge that may demand new an­nual appropriations; but, by a more wise application of moneys already appropriated and offices already au­thorized, to provide for the better education of the young officers of the navy. It is my design not to in­voke new legislation, but to execute more effectually existing laws. Placed by their profession in connec­tion with the world, visiting in their career of service every climate and every leading people, the officers of the American navy, if they gain but opportunity for scientific instruction, may make themselves as distin­guished for culture as they have been for gallant con­duct. For the purposes of instruction the department can select from among twenty-two professors and three teachers of languages. The object of the department being to make the simplest and most effective ar­rangement for a school, you will be the highest officer in the establishment, and will be entrusted with its government. One great difficulty remains to be considered: at our colleges, and at West Point, young men are trained in consecutive years; the laws of the United States do not sanction a preliminary school for the navy, they only provide for instruction of officers who already are in the navy. The pupils of the Naval School being, there­fore, officers in the public service, will be liable at all times to be called from their studies and sent on pub­lic duty. Midshipmen, too, on their return from sea, at whatever season of the year, will be sent to the school. Under these circumstances, you will be obliged to arrange your classes in such a manner as will leave opportunity for those who arrive to be attached to classes suited to the stage of their progress in their studies. 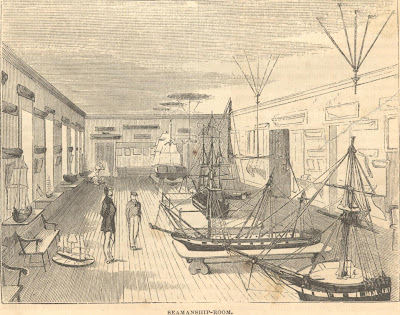 Having thus expressed to you some general views, I leave you to prepare and lay before this department, for its approbation, a plan for the organization of the Naval School at Fort Severn, Annapolis. Com. FRANKLIN BUCHANAN, U. S. Navy. 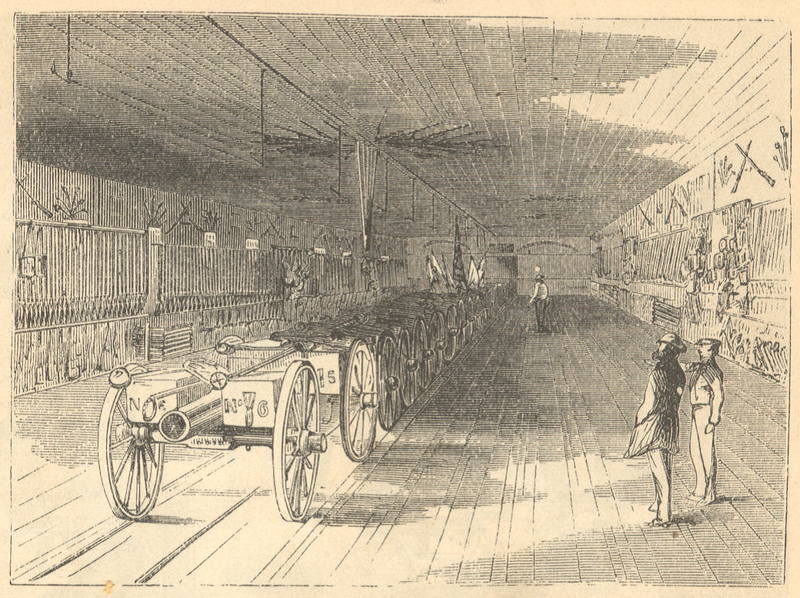 It will at once be seen that the task thus con­fided to Commander Buchanan was one demand­ing considerable skill and ability in order to mas­ter it, and to so arrange the classes that there should be no clashing of interests, no losing sight of the main object of the new system - to afford to each individual the assistance necessary to enable him to pass his examination for promo­tion. Sir, - I have the honor to acknowledge the receipt of your communication of the 7th instant, and I respect­fully present for your consideration the enclosed plan, which is kept strictly, so far as my knowledge extends, within the means now at the disposal of the depart­ment. 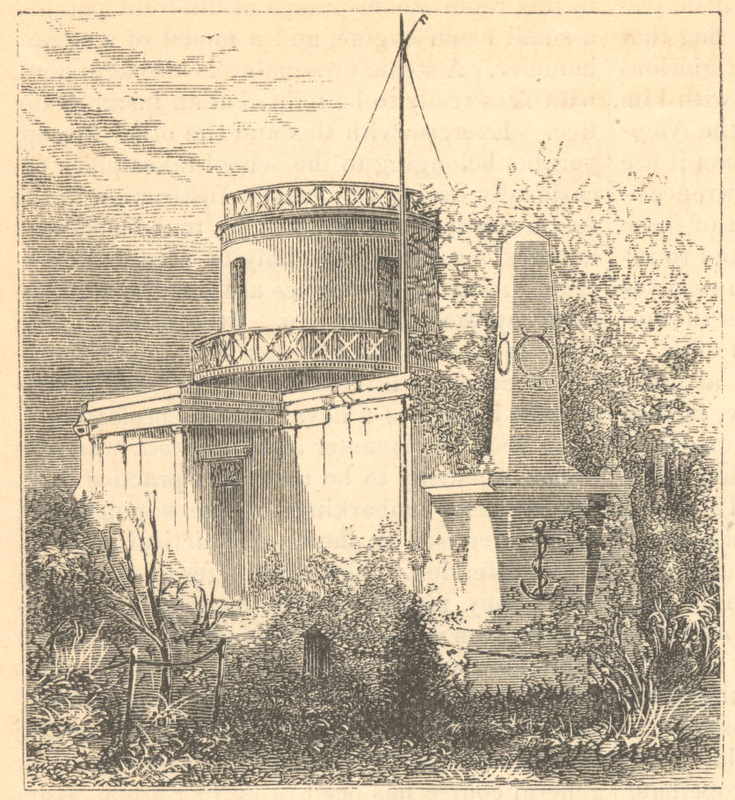 As the navy increases, and the country becomes alive to the advantages of a more extended education to those who are entrusted with the maintenance of its honor abroad, and who are so frequently called upon to perform intricate diplomatic services, an enlarged system will doubtless be provided for. For the mid­shipmen now in the service, I recommend that the pres­ent probation of five years be adhered to, and the pro­posed division of that period is based upon this view. All of which is respectfully submitted by. "Every applicant for admission to the school must be of good moral character, not less than thirteen nor more than seventeen years of age, and must be exam­ined by the surgeon of the institution to ascertain if he be free from all infirmities which would disqualify him from performing the active and arduous duties of a sea life. He must be able to read and write well, and be familiar with geography and arithmetic. "When an acting midshipman receives his appoint­ment, he is to be attached to the Naval School, subject to the exigencies of the service. Those whose conduct and proficiency meet with the approbation of the su­perintendent and academic board will be retained in the service and sent to sea. After performing sea duty for six months, and receiving a favorable report for their conduct during that time, they will be entitled to warrants bearing the date of their acting appointments. “A midshipman, after serving three years at sea as now required, will report at the Naval School to pursue his course of studies preparatory to his final examina­tion." The acting midshipmen appointed under the new regulations constituted the junior class, and remained at the school until their services were required at sea, and at the expiration of their cruise they returned for their final exam­ination. The senior class was composed of mid­shipmen who had performed the required sea service, and were preparing for the final ordeal. 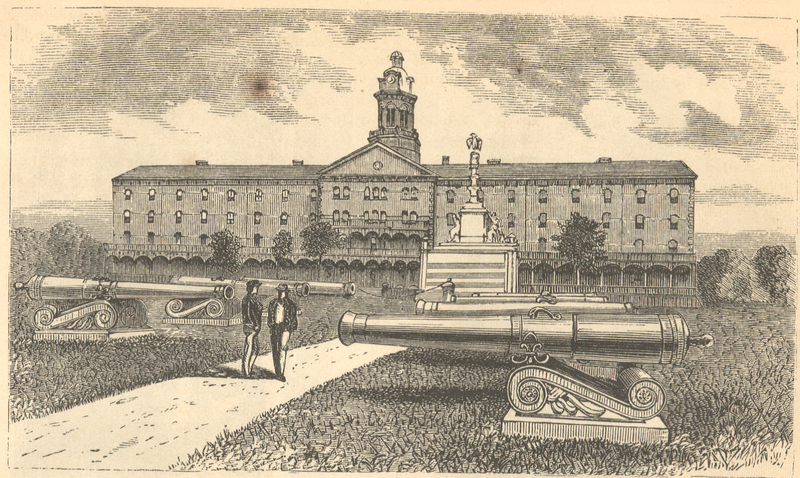 Under this system the midshipmen of the date of 1840 were graduated in June, 1846; and each successive class graduated in the following years until 1851. In 1850 the title "Naval School” was changed to "Naval Academy," and in the following year the present course of four years was adopted, a modified course being fixed for those pupils who had been appointed previously to this year; those of 1851 graduated in 1855. There have been quite a number of classes in the various departments of instruction, and at present they are as follows, viz. : Seamanship (including Seamanship, Gunnery, Naval and Infantry Tactics, etc. ), Mathematics, Steam Enginery, Astronomy and Navigation, Physics, Ethics, French, Spanish, Drawing, Defense and Gymnastics. The officer next in rank to the superintendent (styled Commandant of Midshipmen) is the head of the Seamanship Department, with an officer junior to him in charge of the different branches. Officers of the navy, of various grades and corps, are assigned to duty as heads of the remaining de­partments, and as assistant instructors. The course of studies lip divided as follows, each study occupying as much time as can possibly be given to it. There are three recitations each day (except Saturday and Sunday), acid one drill of some description. Fourth Class – First Year. Arithmetic, Algebra, English Grammar, Geography, History, Composition, Drawing, French (begun). Third Class – Second Year. Seamanship, Gunnery, Geometry, Trigonometry, Mensuration, Descriptive Geometry, Mechanical Draw­ing, Practical Exercises in Steam Enginery, History, Rhetoric, French, Drawing. Second Class – Third Year. Seamanship, Ordnance and Naval Gunnery, Naval Light Artillery, Steam Enginery, Astronomy and Navigation, Analytical Geometry and Calculus, Me­chanics, French, Spanish. First Class – Fourth Year. Seamanship, Squadron Tactics, Gunnery, Chemistry, Practical Exercises in Steam Enginery, Navigation, Astronomy, Marine Surveying, Physics, International Law, Constitution of the United States, Articles of War, French. Under the laws of Congress there is allow­ed one midshipman at the Academy for each Congressional District, one for each Territory, and one for the District of Columbia. The President appoints from the District, and also has ten appointments at large annually, from the sons of officers of the army or navy. The nomination of all other candidates is made by the Secretary of the Navy on the recommendation of a member or delegate from actual residents of his district or Territory. A vacancy from each district is caused once in four years by graduation, besides others caused by dis­missals and by inability to finish the academic course. Candidates must now be between fourteen and eighteen years of age, and must present certificates of good character from persons of good repute, especially ministers of the Gos­pel, principals of high schools, etc. They must pass a medical examination as strict as that required to be passed by a recruit; and they must also pass before the Academic Board a satisfactory examination in reading, writing, spelling, arithmetic, geography, and English grammar. On passing both these ordeals, the candidate obtains his appointment as midship­man, receives his traveling expenses from his home to Annapolis, and is required to sign ar­ticles binding him to serve in the navy for eight years (including his time at the Academy), unless sooner discharged. He must immediately procure his uniform and outfit, which must be paid for in advance, and he must also deposit $100 for the purchase of text-books. He is now placed on board one of the ships attached to the Academy until the commencement of the academic year, when the new class removes to the “Junior Buildings." Up to 1861 the grounds had been enlarged by purchase, and by the building of a sea-wall, and filling up to it from the original shore­line. Of the buildings originally transferred by the War Department there remain (besides the Fort) only those of" Superintendent's Row," and none of this row in its original shape. The wooden structures originally occupied by the midshipmen were gradually replaced by the quarters now known as the "Junior Build­ings," the last of these having been completed in 1853. 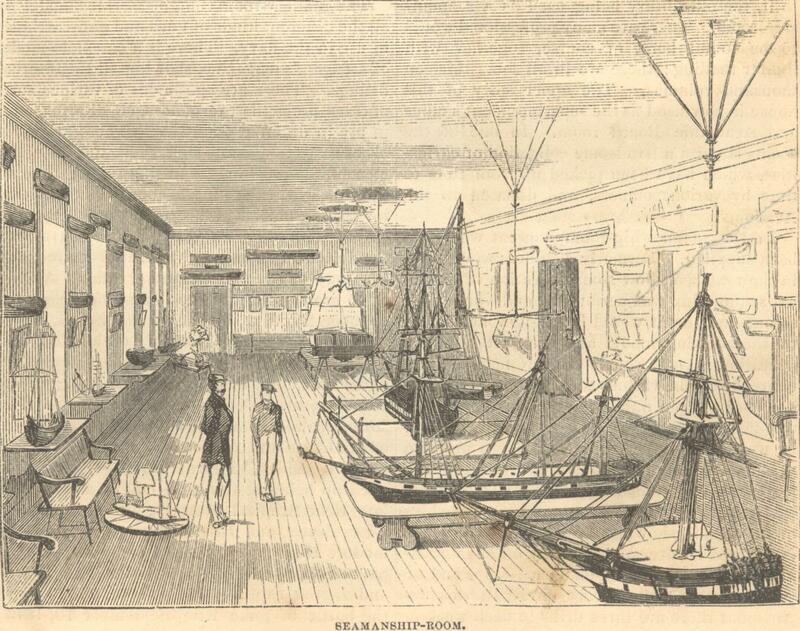 In this year were also completed the "Seamanship Building," originally designed for a mess hall and library, and also the gas and steam works. The "Gymnasium," built upon the walls of Fort Severn, was finished in 1851, and was originally used as a battery for exercise with great guns. In 1854 the "Ob­servatory" and "Gunnery Blinding" (the latter being originally the chapel) were completed; and between 1855 and 1860 the "Hospital" and " Officers' Row" were built. Off Vera Cruz, December 8, 1846. As a tribute of respect. While in the discharge of their duties. The Naval Monument was erected to the memory of Captain Richard Somers and Lieu­tenants James Caldwell, James Decatur, Henry Wadsworth, Joseph Israel, and John 0. Dorsey, who fell in the attack made on the city of Trip­oli in 1804. 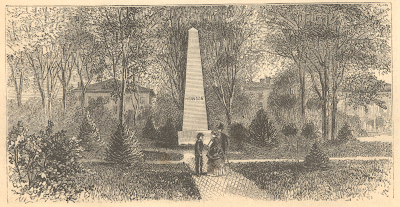 It was erected in 1808 and stood originally in the Navy-yard at Washington, but was afterward removed to the Capitol grounds. In 1860 it was, by authority of Congress, removed to Annapolis. In the fall of 1859 the quarters on shore were found insufficient for the accommodation of the students, and the sloop of war Plymouth was used by the fourth class as quarters. As this vessel was also used as a practice ship during the summer, it was thought advisable to station a permanent vessel at the school, and the frigate Constitution, "Old Ironsides," was sent there in 1860, and the fourth class of that year quartered on board her. In the spring of 1861, at the commencement of the war, nearly all the students from the se­ceding States resigned, and the Academy was temporarily disorganized. Studies were sus­pended, and every preparation made to resist the attack which had been threatened. 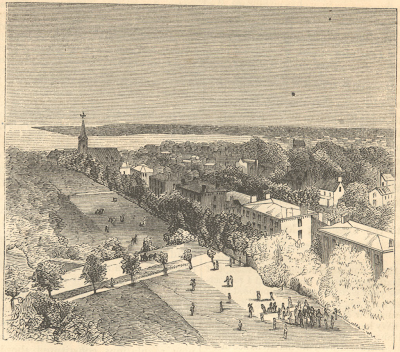 The safety of the place was assured by the arrival of the Massachusetts troops under General Butler, followed soon after by the Seventh New York. The frigate was towed over the bar, the mid­shipmen embarked upon her, and the vessel was sent to New York, where she remained for some time, the school meanwhile being turned over to the War Department and used as a hospital. After some waiting the Navy Department was again indebted to the good offices of the War Department for the offer of Fort Adams, at Newport, Rhode Island, as a suitable place at which to re-establish the school. The ship was sent to Newport, the officers and professors, with the records and the library, with its various curiosities, coming by steamer from Annapolis. The need of officers was so great that all the midshipmen, except the fourth class, were de­tached from the school and sent at once into active service without finishing their academic course. It was found that the fort itself was too damp to be used as quarters, so the ship was moored close to the wharf and used for that pur­pose. Studies, drills, and exercises went on as usual, and on Saturdays the ship was thrown open to visitors. Crowds of people came off to enjoy the music and dancing, not less than to see a ship so renowned in the history of our country. In the fall it became necessary to make some arrangements for the accommodation of the new class, and the Atlantic House, a large and com­modious hotel building, was hired, and the senior (then third) class was removed to it. The su­perintendent's and other offices were also in this building, and the school ship was taken into the inner harbor, moored alongside the wharf on Goat Island, and used for the new class. Pro­vision having been made by Congress for a large increase in the number of students, the existing accommodations were again found inadequate, and the frigate Santee was added as quarters. The sloops Macedonian, Marion, and John Adams were also used as practice ships for exercising great guns, spars, sails, etc. A small steamer ran every half hour from the city to the ships, so that the organization of the institution was kept up, though the component parts were so far asunder. This arrangement continued until 1865, great efforts having been made meanwhile to cause the permanent location of the school to be made near Newport. Liberal offers of land, etc., were made, but all to no avail; and in that year, by authority and direction of Con­gress, it was returned to its home, the necessary transfers having been made by the War and Navy Departments. Vice-Admiral Porter was ordered to the su­perintendency, and taught by the experience of the war just finished - he induced the gov­ernment to make a great many improvements in and about the grounds and buildings. The grounds have been greatly improved by plant­ing trees and shrubs, laying out new walks, erecting fountains, etc. There have also been built some new officers' quarters, the Steam Building, the Chapel, the Laboratory, and the Senior Building. In this last building are the mess-hall, laundry, kitchen, etc., together with a number of reci­tation-rooms, so that, with the exception of steam and physics, all instruction is given un­der one roof. The fourth class recite in the old recitation-hall, taking their meals with the rest of the school in the Senior Building. The grounds have been enlarged by the acquisition of the Maryland gubernatorial mansion, and the land belonging thereto, and also by the purchase of a farm (known as Straw­berry Hill) of one hundred and fourteen acres, close at hand. Efforts have been made to pur­chase the small plot of land lying between the Academy walls and the farm; but Congress has not yet seen fit to appropriate the necessary funds. On a high point of land on the farm, from which is obtained a beautiful view of the Sev­ern River and the Academy, with its surround­ings, has been laid out a cemetery for the bu­rial of deceased officers and men belonging to the navy. Here are the graves of Lieutenant-Commander Flusser, killed in the sounds of North Carolina, and of Lieutenant Samuel W. Preston, killed in the assault on Fort Fisher. Beyond the cemetery is a handsome park, with a diversified surface of hill and dale, with wind­ing paths and drives, about five miles in length. The rest of the farm is devoted to raising fruit and vegetables for the benefit of the school. 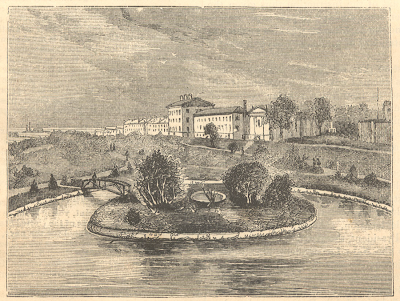 A large and commodious hospital has also been erected in one of the most beautiful locations on the new purchase. Upon the purchase of the Governor's House the Academy walls were extended so as to take it within the limits; the lower floor was fitted up for the library, and the books, etc., removed to it, the old library being used as a seaman­ship-room. There are many professional works to be found here, of course, together with lighter reading; there are in all some thirteen thousand volumes. The upper story of this house is now used as the superintendent's office and Academic Board room. In one of the rooms is quite a handsome collection of curios­ities, which have been picked up from time to time by various officers, and donated to the Academy. In the seamanship-room a great want has been supplied. Formerly a student would read in the text-book how some operation of practi­cal seamanship was performed, and would have to imagine how it would look; now he can go to the working model and see just how the operation is performed, and, if need be, go through all the various steps himself. There are here a large number of models of various wooden and iron-clad vessels of our own navy; as well as of other services. There are also working models of dry-docks, navy-yard sheers, launching-ways, masting, and heaving down vessels, carrying out anchors in boats, of ships under all sail, showing the exact w' in which every rope is rove, and of many other interest­ing things to be found on board ship, and of practical application every day. In this department there are three drills in each week in exercising sails, spars, or boats, whenever the weather permits ; if not favorable, the exercise consists in practice with army signals, in learn­ing how to knot and splice, etc. The gunnery-room contains working models of all the different kinds of guns and gun-carriages in use in the navy. There is a complete model of a frigate's magazine, showing all the internal fittings. There are specimens of various sorts of fuses, projectiles, torpedoes, small-arms, etc., in use in different countries. There are mod­els of flasks for casting shot, shell, and guns, and also a large machine for testing the strength of the iron used in casting cannon. Not the least interesting objects in this room are the captured flags displayed upon the walls. They have been carefully and jealously guarded and repaired, and are now in a good state of preservation Among them are the flags of the Macedonian, captured October 25, 1812, by the United States, under command of Captain Decatur; of the Guerriere, captured August 19, 1812, by the Constitution, under command of Captain Isaac Hull; of the Java, captured December 29, 1812, by the Con­stitution, under command of Captain Bainbridge; of the Cyane and Levant, captured by the same "Old Ironsides," February 20, 1815, the good old ship being at this time commanded by the late Rear-Admiral Stewart; of the Confiance, Chub, Linnet, and Beresford, captured by Com­modore Macdonough's squadron on Lake Cham­plain, September 11, 1814; of the Chippeway and Detroit, captured by Commodore Perry in the battle of Lake Erie, September 10, 1813; besides various other trophies of but little less interest. Here is to be seen, also, the flag that Perry flew from his mast-head on that glorious September day, and which he carried with him when he shifted from the Lawrence to the Niag­ara in the heat of battle; inscribed upon it are the immortal words of the dying Lawrence­ "Don't give up the ship." The sight of these trophies of former days is well calculated to inspire the young midshipmen with high resolves to endeavor to do their duty as well as the he­roes gone before, should ever occasion offer. In this department there are drills at great guns, small-arms, naval light artillery, mortar and iron-clad practice. The great-gun exercises take place on board the gunnery ship. For the artillery there are twenty-four 12-pound howitzers, and for infantry five hundred breech-loading cadet muskets. There is a 13-inch mor­tar mounted upon the sea-wall, at which the first class are exercised. The iron-clad Amphitrite is used also to exercise this class at 15-inch gun practice, as well as to explain to them the construction of the Monitor class of vessels. In the model-room of the Steam Building are models of various kinds of boilers, propellers, steam-gauges, pumps, valves, etc., and a working model of a propeller engine, with glass fit­tings, so that the students can see the working of the valves, etc., when the engine is in mo­tion. In the engine-room is a pair of gun­boat engines, with four boilers, so erected that they can be operated by steam in the same manner as if they were on board ship. Two of these boilers are used to generate steam. The other two are open, painted white on the inside, and lit with gas, so that their entire in­terior construction may be seen, and a practical knowledge of the arrangement of the stays, braces, etc., can be obtained. There are also in this room steam-pumps of different patents, a small beam engine, and a model of a steam-hammer. A steam fire-engine is also kept here, with fires ready to be lighted at an instant's no­tice. Exercise with this and the other fire apparatus belonging to the school takes place oc­casionally during the year. Instruction in the steam department is given by text-books and lectures, but more especially by practical exer­cises, in which the engines are manipulated en­tirely by the midshipmen. It is believed that there is no institution in the country that pos­sesses equal facilities for the study of this im­portant branch of a naval officer's profession. 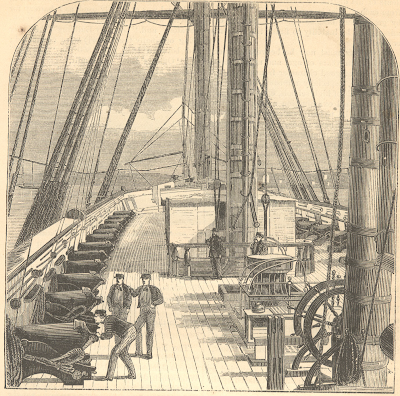 In 1851 the steamer John Hancock was sent to the Academy to be used as a practice ship, the students embarking for the summer and being exercised in the more practical parts of their profession. The advantages derived from this happy plan of combining theoretical in­struction on shore with practical seamanship on board ship were soon evidenced ; and since that time there has been a practice cruise every summer (except that of 1861), different sailing vessels having been used for that purpose. The general course has been to go to Europe, visit­ing some of the principal naval ports of En­gland and France, returning by way of Madei­ra. There have been some few cruises on our own coast, but the foreign ones have been most in favor. The officers for these cruises are detailed from those serving at the Academy in the various departments. There are appointed from these officers instructors in practical sea­manship, gunnery, and navigation; and not only are the midshipmen thoroughly instructed in these different branches, but they are also practiced in the duties of officers. Those not engaged in performing these duties are distrib­uted about the ship, where they can obtain a practical knowledge of the duties of a seaman. There are quite a number of vessels now at­tached to the Academy, and used for different purposes. They are the sailing frigates Constitution and Santee, sloops Savannah, Macedo­nian, Marion, and Dale, and the double turreted monitor Amphitrite. The Constitution is used as a receiving ship for the new class of each year, and for the men attached to the station. The Santee is used as a gunnery ship, being armed with twenty-four 8-inch and twenty-four 32-pound guns of the new pattern, mounted upon the iron gun-carriages recently adopted. The Savannah and Macedonian are used as prac­tice ships for the summer cruise. The Marion is used for exercising with spars, and the Dale for exercising with sails. These vessels are all moored alongside the lock, and are convenient of access. The Monitor lies in the stream, and is considered to be by no means the least in­teresting object to visitors. These vessels are all kept in good condition, and are of much more service than if kept at a navy-yard, while they are no more expensive to the government. In the department of Defense and Gymnas­tics instruction is given by two sword-masters and one gymnast. The course commences with the fourth class year, and continues throughout the entire term at the Academy. Occasionally the more advanced students give exhibitions of their skill in these branches in the gymnasium, in the presence of the officers' families and of visitors from the city. These affairs generally conclude with dancing. The band of the Acad­emy is a very fine one, and furbishes music twice a month during the year for a hop, and occasionally for a ball. There is a ball and a boat club in each class, the members of which practice and train as much as their duties will permit. The ball matches are numerously attended, and great interest is excited among the differ­ent classes: occasionally an outside club plays a match with tile Academy champions. The boat races take place between the first and second class in four-oared shells, and between the third and fourth in lap-streaks. The senior class in each generally wins, owing to the advantage given by their extra year at the school; but the date of 1866 won in both their second and first class years (1869 and 1870), and the fourth class beat the third at the last race in the spring of 1870. The shell-boats were pulled so well and made such good time that in 1869 a general challenge was given to any club in the country by Vice-Admiral Porter, who was then superintendent. It was accepted by the Quaker City Club of Philadelphia for 1870; other clubs declined on account of the early date of the race; which must take place before the close of the annual examination on the 1st of June. There was naturally a great deal of excitement about this race, as the midship­men had the disadvantage of being obliged to attend their usual duties besides the pull­ing. Mr. Blakie, of the Harvard Club, had been the referee in the previous race between the classes, and he was so pleased with the re­sult of that contest that he consented to coach the Academy crew for their trial with the Quaker Citys. The course is three miles in length, in plain sight from the various build­ings in the grounds, and on the appointed day a large crowd was present. At the start the midshipmen drew slightly ahead of their op­ponents, and kept the lead, continually increas­ing their distance until the finish, making the three miles in twenty minutes and twenty-five seconds. The winning boat's crew in the senior race are presented with the champion boat-flag, and have their names placed upon a silver band around the staff. The flag is retained in their names until the next year, when it is again transferred to the winning crew. Besides these amusements there is a bowling-alley and a pistol gallery for the use of the students; and it is the aim of the department to make it so pleasant within the Academy limits that there shall be no temptation to the midshipmen to go outside them. It is to be hoped that success will crown these endeavors, and that the students will appreciate the great advantages that they enjoy, and will improve them accordingly. Harper’s New Monthly Magazine. July 1871.